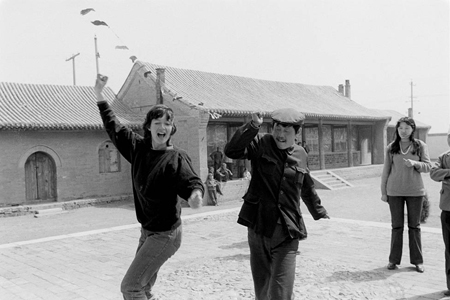 Photo: Inner Mongolia 1986. With thanks to the man in the crowd who borrowed my Nikon to take this picture. From the mid-1980s Melanie Friend worked as a freelance photojournalist, producing photographs for magazines, newspapers, the anti-nuclear movement and other campaigns. She became a member of Format Photographers in 1986, and of Panos Pictures in 1991. In the early 1990s she combined her photography with print journalism (freelance articles for The Guardian and The Times Educational Supplement among others) and freelance radio reporting (features for BBC Radio 4 and BBC World Service). Friend’s book No Place Like Home: Echoes from Kosovo was published by Midnight Editions, USA, 2001 and was widely reviewed in the USA, UK and in Kosovo/ itself. Her exhibition installation The Guide was shown at the Hasselblad Centre, Sweden in 2001. Her current exhibition The Home Front opened at Impressions Gallery as a solo show in September 2013 and is now touring (see ‘News’ & cv on ‘About’ page). An accompanying publication, The Home Front, was published by Dewi Lewis Publishing in association with Impressions Gallery, in October 2013. London Institute (London College of Printing) 1999-2000 part-time. MA in Photography. Distinction for practice. Polytechnic of Central London (1984-88, part-time): BA (CNAA) Degree with Commendation in Photography. University of York (1975-78): BA Hons. (Upper Second) in English & Related Literature. The Home Front (Dewi Lewis Publishing in association with Impressions Gallery) 2013. Border Country (Belfast Exposed Photography and The Winchester Gallery, 2007). No Place Like Home: Echoes from Kosovo (Midnight Editions, USA, 2001). Homes and Gardens: Documenting the invisible (Camerawork, London 1996). Photography & Culture, (Routledge) Vol 8, Issue 3, November 2015. Gallery 44 catalogue, Centre for Contemporary Photography, Toronto, 2010. ‘Europe’ European Central Bank Annual Photography Award, 2008. Ikon Gallery catalogue of international group show Claustrophobia, 1998. Ryerson Artspace, Toronto, Canada, 5 – 29 September 2018. Gallery 310, School of Image Arts, University of Ryerson, Toronto, Canada 16 – 29 September 2018. Sol Mednick Gallery, University of the Arts Philadelphia, USA, 31 October – 5 December 2017. UH Galleries, Hatfield, 14 November 2014 – 31 January 2015. DLI Museum and Art Gallery, Durham, 28 June – 21 September 2014. Impressions Gallery, UK, 14 September – 23 November 2013 (Solo exhibition). Gallery 44, Centre for Contemporary Photography, Toronto, 10 Sept – 16 Oct. 2010 (solo show). European Central Bank Annual Photography Award 2008 exhibitions, Koln & Frankfurt. The Winchester Gallery, Winchester, 6 – 29 February 2008 (solo show). Belfast Exposed Photography, Northern Ireland November 2007-January 2008 (solo show). Hasselblad Centre, Sweden, June - August 2001 (Homes and Gardens: Documenting the invisible). National Portrait Gallery, London: John Kobal Photographic Portrait Award, 2000. Ikon Gallery, Birmingham, Claustrophobia (international group touring show), 1998. Camerawork Gallery, London, 1996: Solo exhibition Homes and Gardens Toured UK 1996-98, and to Houston Center for Photography (USA) 1998. The Home Front was nominated for the Prix Pictet 2013 & 2014 and the Deutsche Börse Photographic Prize 2015. Selected Recent Guest Lectures: (for conference papers see full c.v. available below). School of Image Arts, University of Ryerson, Toronto, Canada 26 September 2018. University of the Arts Philadelphia, Philadelphia, USA, 2 November, 2017. University of Westminster, London, 2015 & 2016. Sainsbury Centre for the Visual Arts, University of East Anglia, 2014. University of South Wales, Newport, 2013. North East Photography Series, Newcastle, 2013. University of Ryerson, Toronto, Canada, 2010. Centre for Transnational Research and Media Practice, Dublin, 2009. University of Bern, Switzerland, 2008. Oberlin College, Ohio, USA, 2007. University of Oxford, UK, 2007. Harvard University, Cambridge, USA, 2002. Reviews: The Guardian (UK), The Independent (UK), Financial Times (UK), Hotshoe International, Source (Northern Ireland), Creative Camera (UK), British Journal of Photography (UK), War & Media Network (Int), Aesthetica (UK), Photo Monitor (UK), Katalog (Denmark), Village Voice (USA), The Progressive (USA), Library Journal (USA), Spot (USA), Globe and Mail (Toronto), Black Flash (Canada). Interviews include: The Guardian, Dazed & Confused, BBC Radio 4 Woman’s Hour, BBC World Service, WBur The Connection (Boston, USA).